A report by 9to5Google suggests that Google plans to shut down the consumer version of Google Hangouts in 2020. Google has not officially confirmed or denied the rumor, and the site cites a "source familiar with the product's internal roadmap" as its source. Google Hangouts would follow other Google products such as Google Inbox, Google Reader, Google Wave, Google Buzz, or Google Plus that the company shut down in recent years or plans to shut down. Update: Google revealed in December that it plans to make the Enterprise products Hangouts Chat and Hangouts Meet available to consumers (and shut down Hangouts). According to the report, Google Hangouts will be shut down for consumers in 2020. Google unveiled a new strategy for Hangouts in 2017 when it launched the two messaging applications Allo and Duo. Google in the meantime started to focus on an RCS-based messaging system for Android called Chat in favor of the messaging application Allo. Hangouts for Enterprise customers was split into Hangouts Chat and Hangouts Meet back then. Hangouts Chat offers group-chat functionality similar to Slack, Hangouts Meet video conferencing. The company abandoned development of the consumer version of Hangouts more or less last year. While Hangouts is still available on the Google Play Store and as part of Gmail, Google's webmail service, recent reviews of Hangouts have been anything but great. Google Hangouts is still a popular application with more than 3.6 million user reviews on Google Play alone. Google never revealed the total number of Hangouts users though. The shutting down was inevitable and delayed only because Allo performed poorly. Google's new messaging effort Chat won't take off before 2019, and that is probably the main reason why the consumer version of Hangouts is retired in 2020 and not in 2019. Hangouts users have a year to find an alternative for the service; some may not want to give Google another chance. Now You: Are you a Hangouts user? What is a suitable alternative? A report by 9to5Google suggests that Google plans to shut down the consumer version of Google Hangouts in 2020.
j/k, I never used this, it was a system application on my Nexus 4, and something I always disabled. They’re closing all the useless Apps. I never used it either. Let’s hope they shutdown Gmail, Google Now and all the other crap Google insists on loading up Android with as well soon. Buy a Chinese smartphone version and you won’t have any Google apps pre-installed, and Google Play store as well. If I had to buy a new phone every time Google changes something, I’d be destitute in no time at all. Then you shouldn’t buy a phone with Google stuff on it. Or buy a new one without them. They do exist. Problem solved. Is it that hard? Really? Give me an example then. It will need to be one which supports all the Google Play store apps and is freely available in Europe for a reasonable price. You just don’t get it. There are great alternative mobile os, like plasma mobile, librem, tizen, without Google’s nonsense. You want to use Google play without Google. It doesn’t make sense. There is a reason it’s called GOOGLE play, it’s a google product and all these apps that you install from it are a part of GOOGLE’s ecosystem, that’s why their developers are putting them there. Respect the developers, it’s their apps and their choice about how they want to distribute their software. If you don’t like that they want to be a part of Google’s ecosystem, don’t buy a phone with Google ecosystem inside or wipe it out and install an alternative os. Oh, I get it very much. It’s just that trolls like you can’t stand the fact that some people are not part of the sheep flock and don’t follow the herd wherever it goes. What I choose to like or not like is none of your business. I don’t care about your insults. It just shows what kind of person you are. Like John said, you have options. Use them instead of bitching all day, use a plain android rom, plasma mobile, librem, you have so many options. You can also install a plain Android ROM. Those come without Google’s infrastructure built in (although you can install it if you really want it). Yes, I’m aware of that John, but they don’t support the apps I run unfortunately. @TelIV: The apps your run are probably relying on Google Play services. It’s an increasing problem. So, unless you want to look for alternative apps, you’re pretty much married to Google. This is one of the reasons why I’m leaving the Android ecosystem entirely. Most apps, even free ones, have in-app purchaces. They have code on them that make them not to run without gplay, apps want in-app purchaces to work. Try a plain rom and a store like f-droid. Maybe the apps you want are there. Or an iphone, I don’t know, but you will have to deal with apple’s store in this scenario. I don’t know about “most”, but certainly a lot do. I never install apps that offer in-app purchases, but I still manage to get all the functionality that I need. Just like Google+ that was really ‘popular’ but got killed too. I don’t think you should use the term ‘popular’ if it’s installed in every Android devices. But even with its monopoly power, Google still cannot make messenger better than whatsapp. Is it that hard to make a decent messenger app? Keep gmail, gdrive (increase free storage to 500GB), google search and get rid of all the rest. It’s all garbage. Yeah, I’m serious. Get rid of Chromebooks too, they are dead. ChromeOS? Eat dirt. This would also declutter Android so that all phones would magically have a battery that lasts two weeks. Google photos and maps are great. I use them every day. There are many people that use these services and we don’t care if you think they are garbage. I agree that they should increase the free storage of gdrive to 500gb. But I don’t see it happening in this universe, I could see them limiting it to 5GB like OneDrive and Amazon Drive. 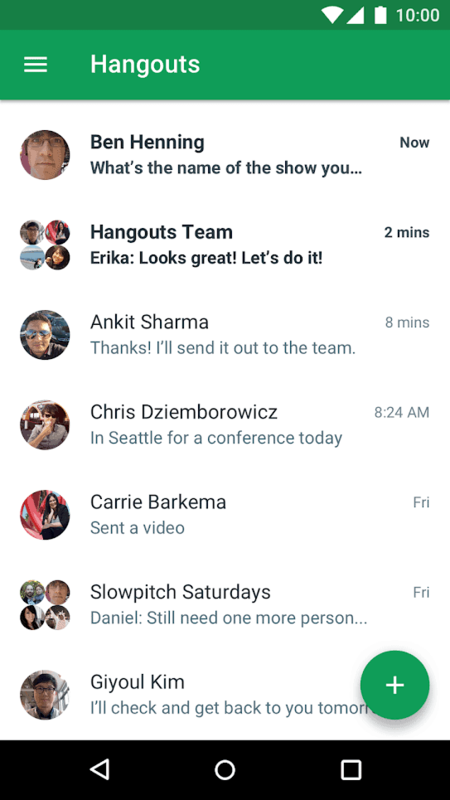 Hangouts is still the best app of its type and offers more features than any other. I’ve been using it for years and will be sorry to see it go. Despite what other posters are saying – scoffing and scoring, mostly – I believe many people still use it. As far as I know, no other app offers integration with my carrier number, so that I can call any number in North America over wifi and the receiver will see my actual cell number on call display. Google Talk was the best messenger but it declined after it changed to Hangouts. No more desktop client, no more email notification, so sad! On every Android device I’ve ever had – no choice. Never used it, never seen the point of it. As others have said, I hope Google at least have the decency to wipe it from our devices. Bad enough when we can’t erase an unwanted app completely, without it being just dead weight anyway. Both Google and Apple think their competitor’s mobile OS is crap – they’re both right. Why don’t they just open source it rather that shut it down? My experience is that Hangouts is considerably more stable than competing products. I use it constantly and will be sorry to see it go. I was Google Talk user, forced to update to Hangouts (as the other users). If I get one more app like this – okay. If not, I have to find one more app like this. But with integration into Gmail it was convenient. Hangouts never worked well enough for me to actually use it. It’s always been slow and buggy to the point of uselessness. After reading the comments of people here who seem to find Hangouts actually usable, it dawned on me what the difference is — I have never used Hangouts on a mobile device. It’s always been in a browser on a desktop. Perhaps that’s the part that was broken! Always thought Hangouts was being pushed unnecessarily. When in Contacts and trying to dial using GVoice, it always launches Hangouts – wish that this could be changed.